Halloween Memory #1 – Jenny and Jonathan Got Married! This photo is why I want to write about Halloween now. I saw it last week as I searched for something else on my hard drive. 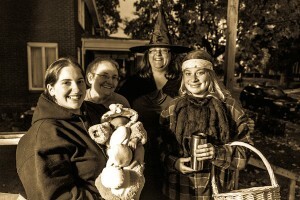 This is a picture of me, my sister E., my mother-in-law Fran, my sister-in-law Marissa, and Baby A. We posed for this photo on Halloween 2014. Baby A. is my sister-in-law’s son, so he is our nephew. Baby A. was about 4 weeks old on Halloween 2014. Baby A. will turn two years old shortly. Baby A. and his parents live two blocks from us. In the weeks before and after Baby A. joined our family, several scary things happened in our neighborhood. Then the cold rain fell all evening on Halloween. With all this, we still got over 200 trick-or-treaters at our house. I counted. My mother-in-law and father-in-law only got a handful of trick-or-treaters each year at their own house on the hill, so they came down to visit. We had a little party while we handed out candy, waiting for our guys as they did a safety patrol for the fire department. My sister-in-law Marissa showed off her baby to the neighbors. Later, my father-in-law rocked the little boy to sleep in the room where Marissa got engaged to her husband two years earlier on Christmas Eve. Yeah, yeah. I blogged out all of this before. Last time, though, I didn’t mention all of the candy that Fran brought to our little party. To share with trick-or-treaters and also to keep for ourselves. I don’t even want to think about how much she spent buying candy for us. She wanted to see us happy. When Jonathan and Jack got home from their safety patrols, we all went out to Eat N Park for dessert. Me, the family that I married into, and my sister E. So we had two little parties on the same night. The week that we lost Fran, I spent $50 on chocolate at CVS. I bought all of the little candies that Fran used to buy for us. I told Jonathan that it was for his family, and I did share some of it with them. However, I really bought it to comfort myself. I like Halloween because I have a lot of good memories of spending time on Halloween with people I love. So this fall I will post random Halloween memories.